I bought some pasta at the supermarket. 5.3.2 Unsurprisingly, countable nouns can be counted. There can be one, two, three, or more supermarkets in a town. Countable nouns are also known as ‘count nouns’, especially in American English. A doctor worked at a hospital in a small town. An English teacher ate an orange at an inexpensive café. 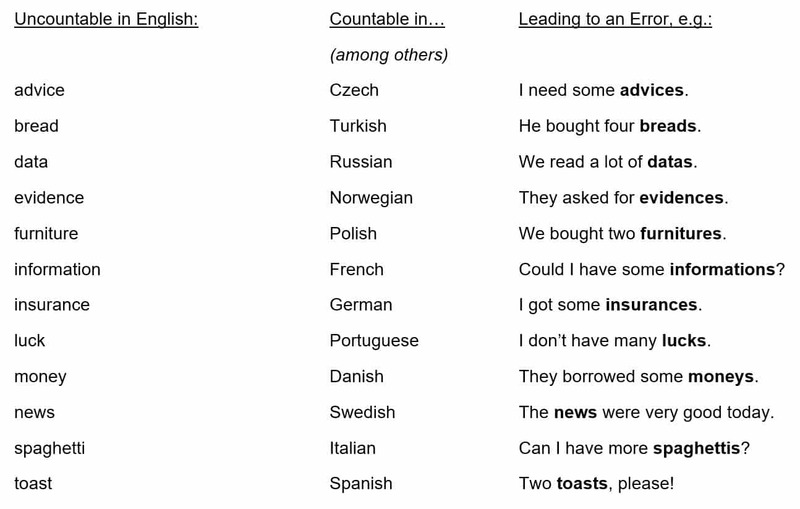 Singular countable nouns must be preceded by a determiner, usually an article (a or an) or a possessive adjective, e.g. my, your, his, her, etc. My sister bought a new car at an auction near her house. Sister bought new car at auction near house. 5.3.3 As you would expect from the name, uncountable nouns cannot be counted. We cannot buy ‘a pasta’ or ‘three pastas’, but rather we have to buy ‘some pasta’ or ‘a bag of pasta’, among other options. Uncountable nouns are also known as ‘uncount nouns’, especially in American English. Uncountable nouns do not have singular or plural forms. There is just one form, e.g. ‘pasta’. Do you want any pasta? No thanks. I don’t want any pasta. The pasta is really delicious. The pasta are really delicious. (countable noun) This book is quite interesting. (uncountable noun) That ham is delicious. (plural noun – near) These trousers are too tight. (plural noun – far) Those apples are too expensive. Uncountable noun: …but there is not much juice in the glass. Simply cut out the cards and then practise matching together quantifier + noun. Use the Mega-List of Quantifiers in English to help you to get it right, or practise with a teacher to hand! Alternatively, follow the lesson plan below. Listen to the free podcast about this activity here. Possible lesson plan: print the two pages onto thin card, then cut out the cards. Focussing on the quantifier cards, elicit whether each one can be used with countable or uncountable nouns, or both. 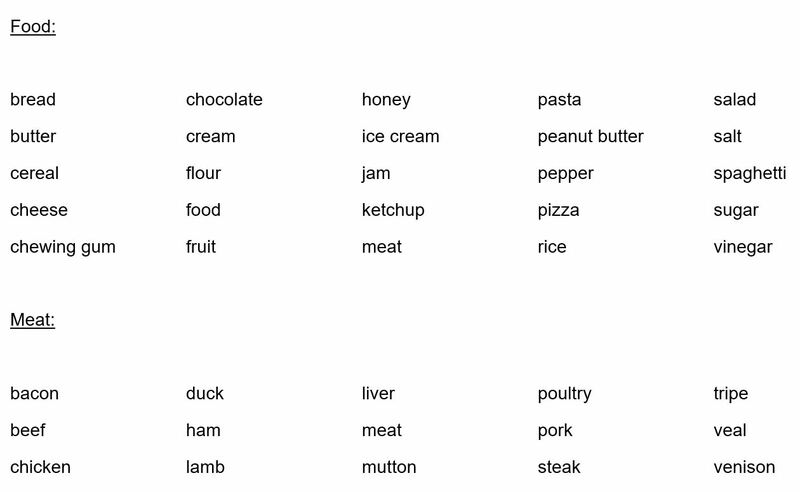 Put all 40 quantifier cards into three groups: used with both groups of nouns; only used with countable nouns; only used with uncountable nouns. Make phrases by matching pairs: quantifier card + noun card, e.g. ‘a couple of’ + ‘apples’. Write sentences with the phrases using different tenses. Game: play quantifier/noun snap – make two piles of cards – quantifiers and nouns; then take it in turns with a partner or small group to turn over a card from each pile; if you get a match = snap! 10 points! cake countable: I made a cake for the party. uncountable: We ate some cake. …and there are other common examples too. We have to learn this relatively small group of nouns and remember that they can sometimes be countable and sometimes uncountable, depending on the context. You could say that these sentences are incorrect, but English native speakers do use their language in many non-standard ways. Students should be aware of this phenomena and try to use this kind of noun in the same way. It would be a good idea to check whether any of these words are countable in your first language and then learn them as potentially error-causing words. There is ________________ sand in my shoe. There is ________________ five pound note in my wallet. There is ________________ wine in the cupboard. There is ________________ butter in the fridge. There is ________________ peanut butter on the worktop. There is ________________ radio in the kitchen. There is ________________ toothbrush in the bathroom. There is ________________ jam in the cupboard. There is ________________ magazine in the living room. There is ________________ queue at the post office. There is ________________ luggage in the car. There is ________________ suitcase in the bedroom. There is ________________ flour in the cupboard. There is ________________ sugar in your tea. There is ________________ bicycle outside. 1. Did you buy _______________ newspaper at the _____________________? 2. There is _______________ tea in the ________________________. 3. We posted _______________ letter at the ________________________. 4. I put _______________ Coca-Cola in my ________________________. 5. There was _______________ water in the ________________________. 6. There isn’t _______________ DVD in the ________________________. 7. Is there _______________ chocolate left in the _______________________? 8. I ate _______________ veggie burger at the ________________________. 9. There was _______________ playground near the ____________________. 10. Is there _______________ soap in the ________________________? 11. I asked Clara for _______________ advice at the _____________________. 12. There is _______________ fly on the ________________________. 13. There is _______________ meat in the ________________________. 14. I saw _______________ elephant at the ________________________. 15. There was _______________ new teacher at ________________________. 16. There wasn’t _______________ furniture in the _______________________. 17. My friend is _______________ guitarist in a ________________________. 18. Did you buy _______________ jam at the ________________________? 19. Is there _______________ red towel in the ________________________? 20. I took _______________ fruit out of the ________________________. There is ________________ rice in the cupboard. There is ________________ dog in the garden. There is ________________ postman coming to the door. There is ________________ alcohol in the fridge. There is ________________ bathroom upstairs. There is ________________ computer in the office. There is ________________ oil on the floor. There is ________________ ice on the windscreen. There is ________________ shirt in the tumble dryer. There is ________________ homework to do later on. There is ________________ food on the table. There is ________________ cheese in the fridge. There is ________________ light switch on the wall. There is ________________ vinegar on your chips. There is ________________ pen in my pocket. 1. I put _______________ paper in the ________________________. 2. Please put _______________ salad on your ________________________. 3. I put _______________ knife and fork on the ________________________. 4. Did we have _______________ homework in Mr. Dell’s ________________? 5. I left _______________ piece of paper on the ________________________. 6. There was _______________ interesting news in the __________________. 7. I noticed _______________ smoke in the ________________________. 8. There is _______________ really good song on the ___________________. 9. There isn’t _______________ ketchup in the ________________________. 10. I bought _______________ cucumber at the ________________________. 11. _______________ good weather was forecast on the __________________. 12. There was _______________ cup in the ________________________. 13. There was _______________ snow on the ________________________. 14. Dan found _______________ pound coin at the ______________________. 15. There is _______________ tree in the ________________________. 16. Is there _______________ coffee in the ________________________? 17. Is there _______________ ruler in your ________________________? 18. There wasn’t _______________ honey in the ________________________. 19. There isn’t _______________ typing program on my ___________________. 20.We took _______________ basket from the ________________________. Extra time: write a sentence for each word. Ex. 5.3.7 Writing Look at the shopping list. Write each phrase again using a more appropriate quantity word. For example: ‘a tin of washing-up liquid’ should be ‘a bottle of washing-up liquid’. 1. A ______________________ of margarine. 2. A ______________________ of Coke. 3. A ______________________ of sweets. 4. A ______________________ of string. 5. A ______________________ of toothpaste. 6. A ______________________ of stamps. 7. A ______________________ of raspberry jam. 8. A ______________________ of lager. 9. A ______________________ of tea. 10. A ______________________ of bread and butter. 11. A ______________________ of soup. 13. A ______________________ of material. 14. A ______________________ of butter. 15. A ______________________ of wine. 1. A ______________________ of medicine. 2. A ______________________ of baked beans. 3. A ______________________ of ale. 4. A ______________________ of paper. 5. A ______________________ of letters. 6. A ______________________ of leaves. 7. A ______________________ of powder. 8. A ______________________ of laughs. 9. A ______________________ of loose change. 10. A ______________________ of flowers. 11. A ______________________ of boiling water. 12. A ______________________ of jam. 13. A ______________________ of bother. 14. A ______________________ of truth. 15. A ______________________ of land. 1. A ______________________ of petrol. 2. A ______________________ of milk. 3. A ______________________ of lemonade. 4. A ______________________ of cake. 5. A ______________________ of chocolates. 6. A ______________________ of quiche. 7. A ______________________ of orange. 8. A ______________________ of orange juice. 9. A ______________________ of sugar. 10. A ______________________ of chocolate. 11. A ______________________ of news. 12. A ______________________ of beer. 13. A ______________________ of fish. 14. A ______________________ of glue. 15. A ______________________ of treasure.